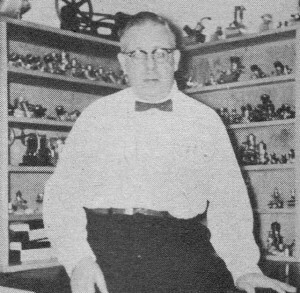 Model engines that were just being released for production in the year this article was written are now 52 years old, and would therefore now qualify as vintage engines in any modern model engine museum. The article's author, Pete Chinn, probably did not even conceive of the possibility while writing his piece in November 1959. He has some enviable model engines from as far back as the Stagner 7.4 cu.in. 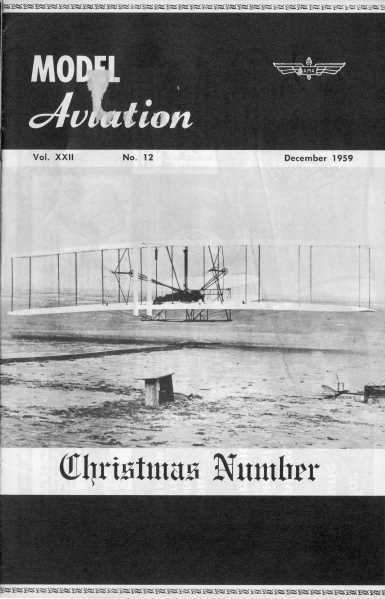 V-4, circa 1909. At the time, the Wright Brothers were developing engines not a lot larger than that for their full-size craft (well, a tad bit larger). That makes model aircraft engines, as an entity, just about 100 years old. Amazing. Sure, there are a few out there older, but not many. The November 1959 edition of American Modeler had the first part of this article with more of Mr. Chinn's model motors. Next to the Brown, every collector of historic engines wants a Baby Cyclone. This, the first of so many Atwood de­signs (others: early Phantom and Torpedo, Champion, Glo-Devil, Triumph, Wasp, Shriek, Wen-Mac), was first marketed in 1935 and was subsequently produced in three modified versions known as the Models D, E and F, from 1936 through 1939. Bruce Underwood, Columbus, Ohio, owns largest collection, over 220 motors. Most complicated production engine, .92 cu. in. Burgess M-5. British G. S. Wizard, latest McCoy, supercharged Rowell (all 60's). German .03 Star diesel, Cox Pee Wee, British Kalper .02 diesel. Swiss Dyno .12 was first model "diesel." Although large numbers of Baby Cyclones were built, they are now very difficult to find, especially the pre-1937 models. Early Cyclones can be identified by their plain unfinned heads and the very earliest models have a fixed timer, speed control being by means of the needle-valve only. These early models sold for $15.75, complete with coil and condenser, ready-mounted on a wood base carrying a gravity-feed fuel tank. The .36 cu. in. 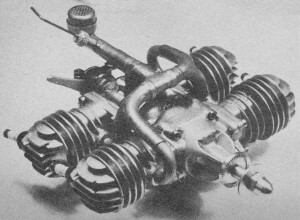 Baby Cyclone (bore and stroke *" x 13/16") pioneered the use of the shaft rotary valve in model aircraft motors. It also differs from the Brown in a number of other respects. The cylinder, for example, is an iron casting with shrunk-on duralumin cooling fins and is secured to the diecast crankcase by a base flange and two screws. Other popular engines of the mid-thirties. included Dan Bunch's .45 cu. in. Gwin-Aero and Mighty-Midget, the G.H.Q. Loutrel and Forster Brothers' not-so-little (nearly 1.0 cu. in.) Little Hercules. Both the Bunch engines and the G.H.Q. were available as fully ma­chined sets of parts or as ready-assem­bled motors. 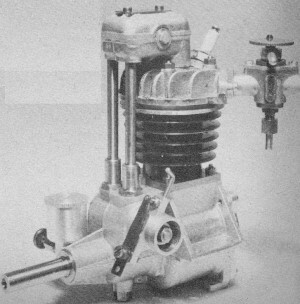 The Gwin and Mighty­Midget were somewhat similar to the Brown in general construction and were among the first quantity-produced model engines to be fitted with piston rings. The Forster and G.H.Q. were two of the very few model engines that survived to compete in the post-war market. 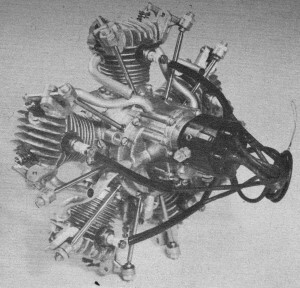 From 1937 onwards, new engines began reaching the U.S. market in increasing numbers. 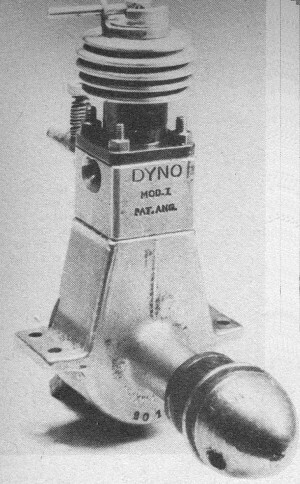 A young model builder named Irwin Ohlsson began selling a new .55 motor with radial mounting re­placing the usual beam mount lugs and which, instead of having bypass and intake passages brazed on, or integrally cast, used a two-piece diecast manifold clamped around a plain machined cylinder. This, the ancestor of the famed Ohlsson & Rice range, and later known as the Gold Seal model, appeared, for 1938, with combined beam and radial mounting lugs, a feature common to every O&R engine down to the present day. All the Ohlsson engines, incidentally, were actually made by the Rice Mfg. Company of San Gabriel, Calif., who also supplied the parts from the James 60 motor of the same era. From the 1940's - Vivell 35, Arden 099, Phantom P.30. Winners of last 3 FAI free flight titles - British Oliver Tiger (1955), Japanese O. S. Max 15 (1956), East German Schlosser 2.5 (1958). British H-P 24 spark ignition, ball­bearing B.M.P. 21 diesel and Allbon 17 diesel. Elf-Four had .39 cu. in. total displacement, 9 oz. weight (a twin and 6 cylinder were also made). British Jensen 60 4-cycle of late 1940's.